Whilst the engine was out for a routine inspection we thought we'd take the opportunity to grab some photos before it's hidden away under the boot lid once more. The engine will be dyno tested to make sure everything is tuned and running correctly. As you can see in the image shown below, the exhaust layout is quite simple but unusual in that the muffler sits directly above the engine. Once loaded please use the left and right directional arrows to rotate the animation. 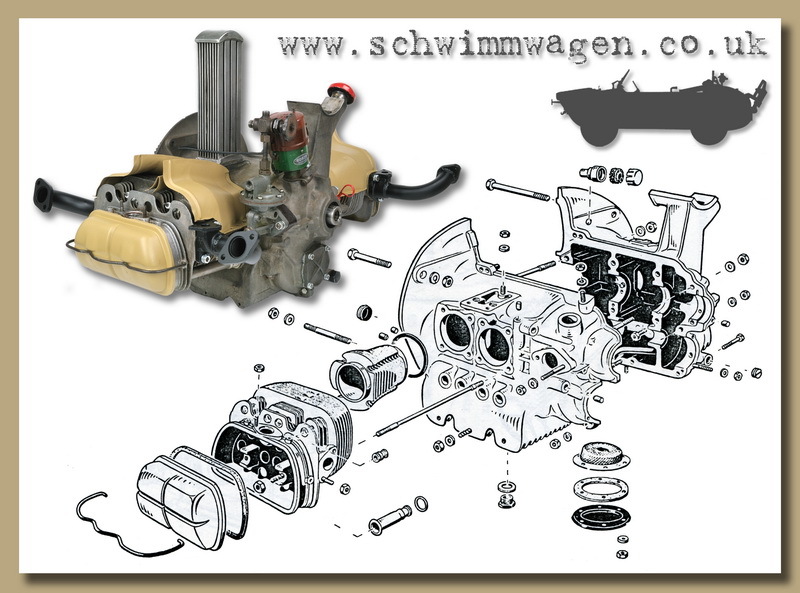 A four cylinder, air cooled, four stroke engine. 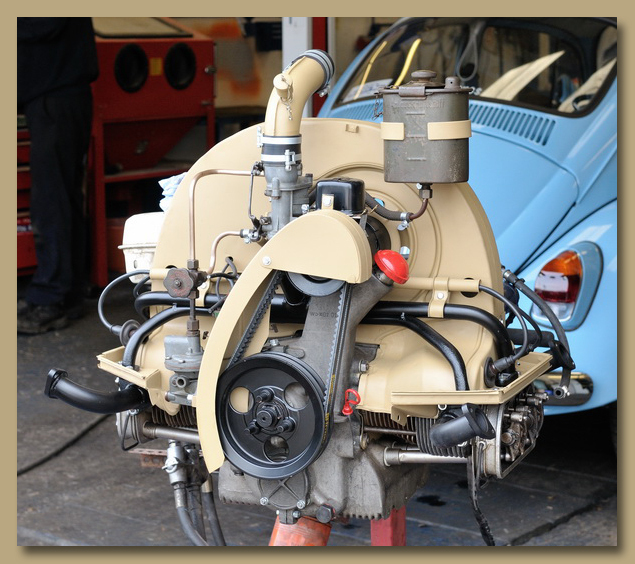 This 22.5hp engine was roughly the same as the engines that would later become synonymous with the more modern Volkswagen Beetles. 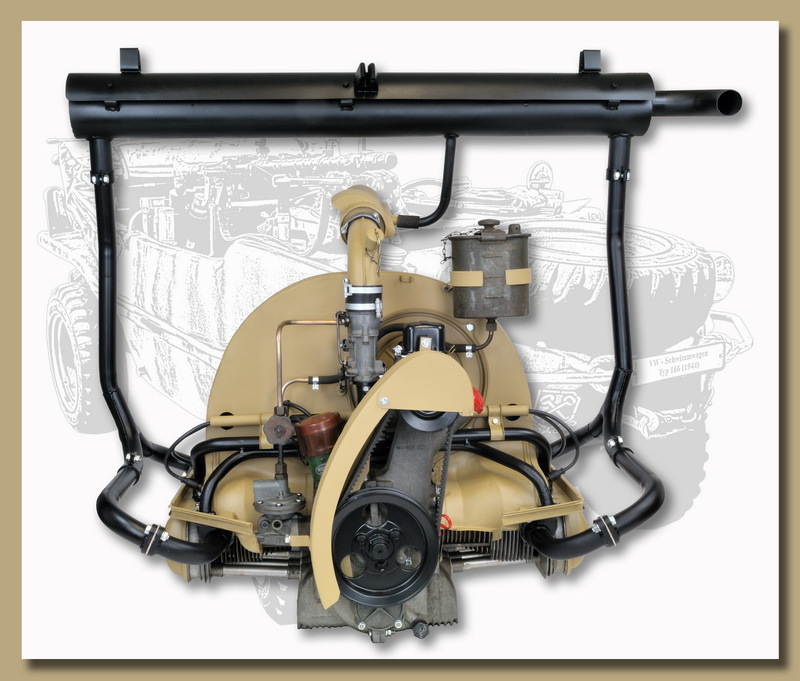 The 25hp engine enabled it to achieve speeds of up to 10 km/h in water and 80 km/h on land. 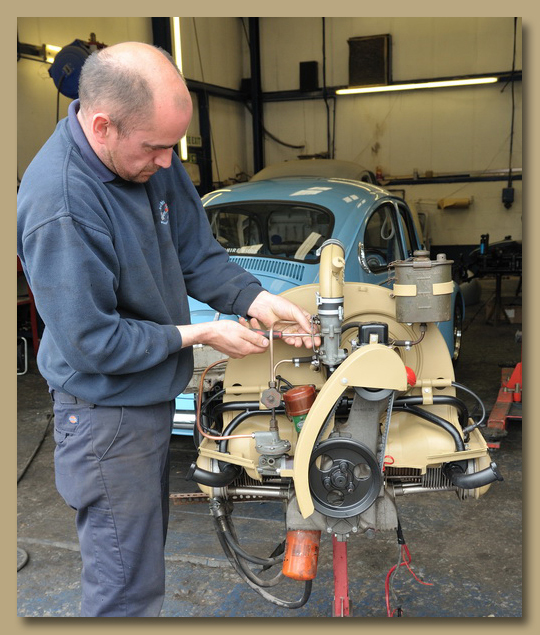 Whilst still out we took the opportunity to take the engine to VW Air-cooled specialists "Berkshire Bugs" for a test and tune-up before final installation back into the vehicle. 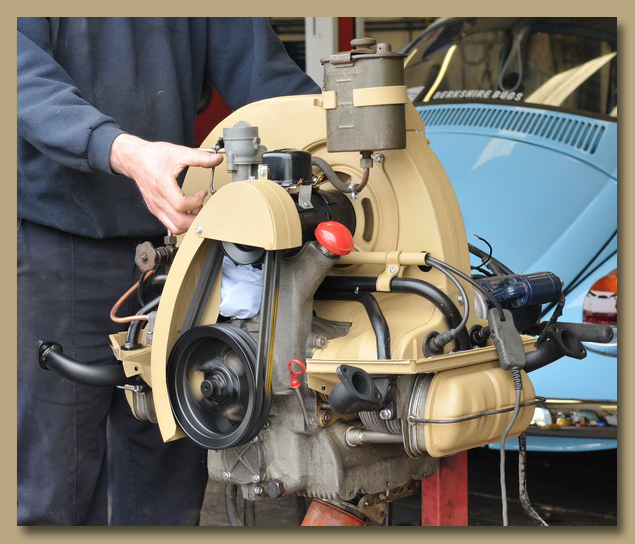 The engine had been sat idle for nearly a year so it was a worthwhile exercise, plus we'd have a better understanding about how well the engine had been rebuilt during its restoration period. 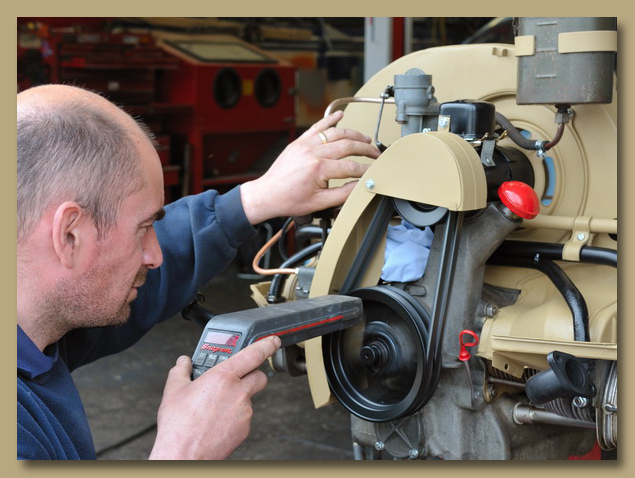 The report back from the mechanic was good news all round, the engine was sound and ran well. 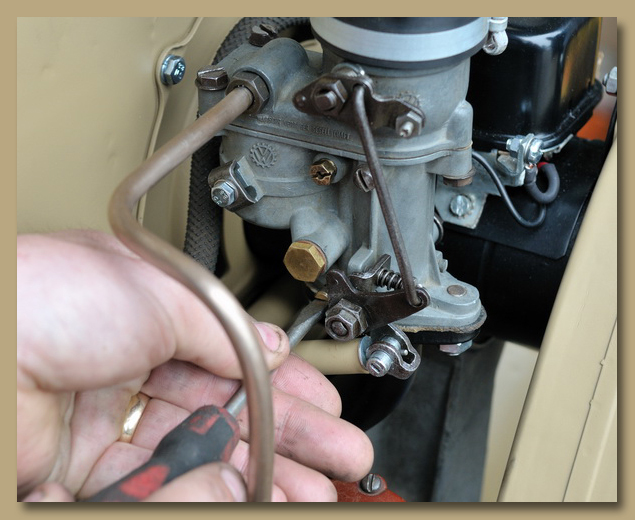 A few initial attempts to start the engine were delayed until the fuel had made its way to the carburettor, once primed it started first time every time. A short video of the days activity can be seen right. Final check through the rev range, not bad for a 64 year old motor. Mixture adjustment checked and set. 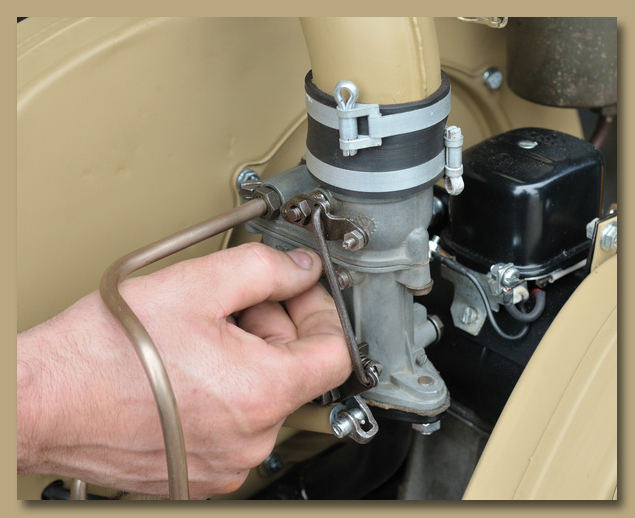 First checks start with the carburetor, the design of the single down draught Solex couldn't be any simpler. Rocker covers removed for tappet adjustment.